Heck yeah, this is easy enough to make on a weeknight. Salmon is one of our go to meals for Meatless Monday, and this particular recipe does not disappoint! 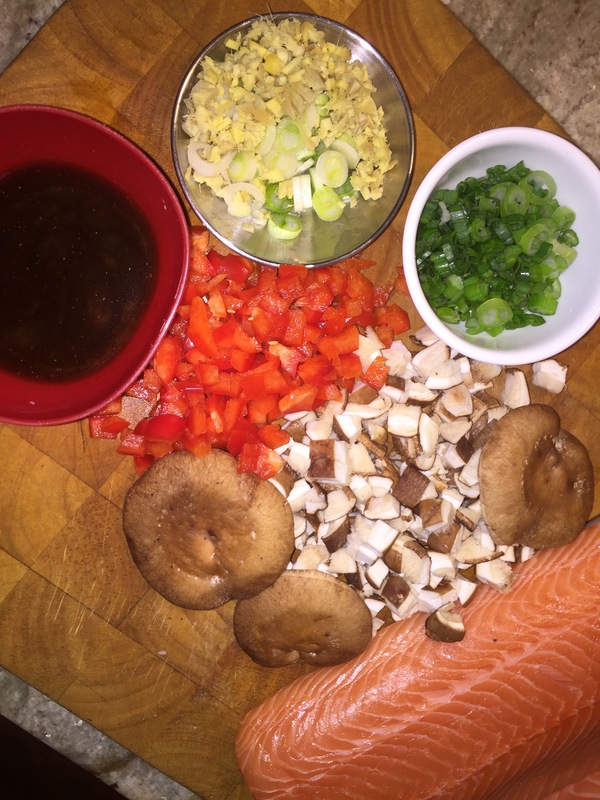 The salmon was moist and the sauce was a lively combination of sweet and savory. Though most glazes are applied with a brush, this chunky mixture of sautéed mushrooms and red peppers is spooned over the fish. The honey helps the crust brown, and a splash of vinegar and a spoonful of chili paste perk up the fish, while the vegetables add texture and color. The reds and greens lend a festive Christmas touch! The raw ingredients prepped for cooking. The oiled salmon sprinkled with coriander. Chopped red pepper and scallions. Adding chopped mushrooms to the softened veggies. 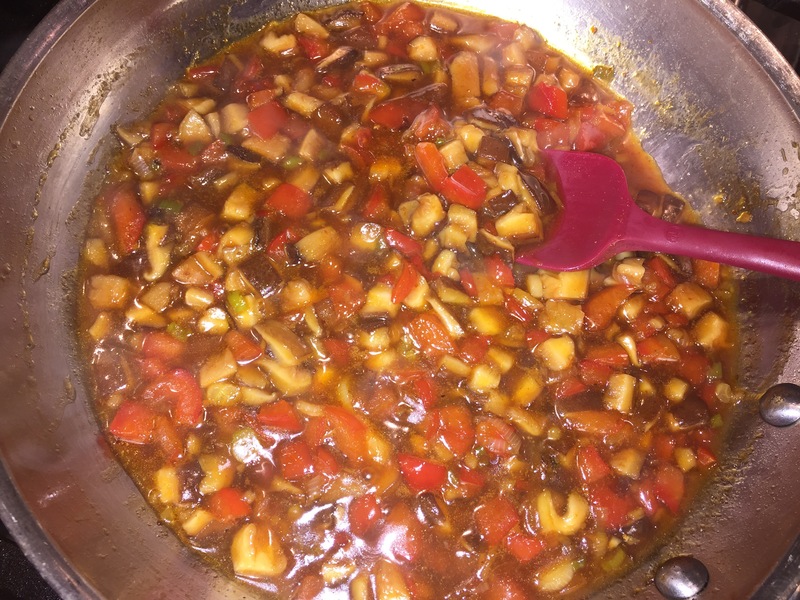 The liquids are added to the veggies and the sauce starts to thicken. The cooked salmon prior to adding the chunky glaze. Position an oven rack about 8 inches away from the broiler element and heat the broiler to high. Oil a large, rimmed baking sheet. 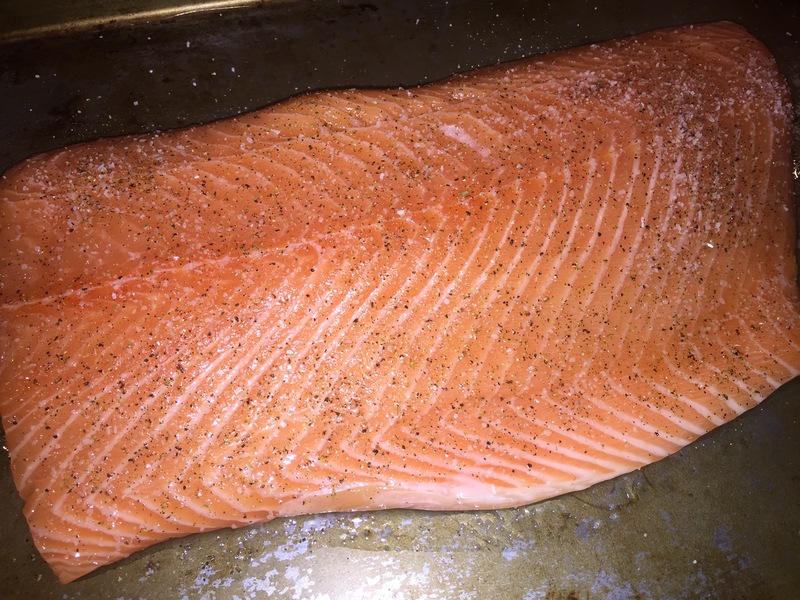 Set the salmon skin side down on the baking sheet, sprinkle with 1 Tbs. oil, the coriander, 1/2 tsp. salt, and 1/2 tsp. pepper, and let sit at room temperature (important) while you prepare the sauce. In a large (12-inch) skillet over medium heat, cook the red pepper, scallion whites, and ginger in the remaining 2 Tbs. oil, stirring occasionally, until the red pepper and scallions start to soften and brown, about 3 minutes. Add the mushrooms, raise the heat to medium-high, sprinkle with 1/4 tsp. salt, and cook, stirring, until they soften and start to brown, about 3 minutes. Add the honey, vinegar, soy sauce, chili sauce, and 1/4 cup water, and bring to a simmer. Whisk the cornstarch with 1 tsp. water and stir into the glaze. Return to a simmer and cook until the glaze thickens, about 1 minute. Remove from the heat. Broil the salmon until it starts to brown and becomes almost firm to the touch, about 8 minutes. Momentarily transfer to the stovetop and spoon the glaze over the salmon. 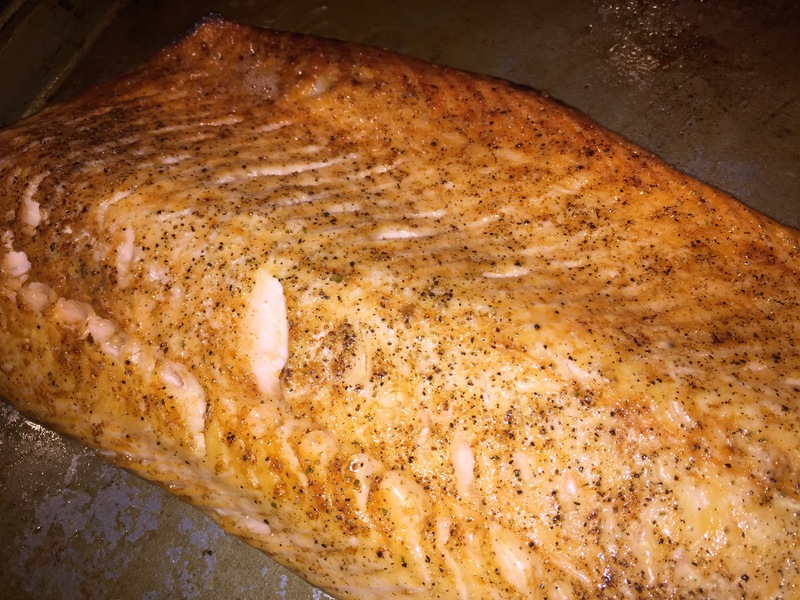 Return to the oven and broil for about 1 more minute so the glaze browns and the salmon almost completely cooks through (check by using a paring knife to flake a thicker part of the fillet). Sprinkle with the scallion greens, transfer to a large platter, and serve. Serve with steamed rice and Stir-Fried Napa Cabbage with Chile and Basil. Slice the cabbage in half lengthwise. Position one half cut side up and slice it across the middle at the point where the ruffled, leafy top gives way to white stem. Remove the core, slice the stem end lengthwise into 1-1/2-inch-thick wedges, and cut the wedges crosswise into 1-1/2-inch pieces (the leaves will separate). Cut the leafy half in the same way. Keep the leaves and stems separate. Repeat with the remaining half cabbage. You should have about 5 cups stems and 4 cups leaves. Heat a wok or a 12-inch skillet over high heat for about 45 seconds and then add the oil, swirling it to coat the pan. When the oil is hot and shimmering, add the garlic and the white stems. Stir-fry until the stems brown lightly in spots and begin to release some liquid, about 2 minutes. Add the fish sauce, sugar, salt, and chile and toss. 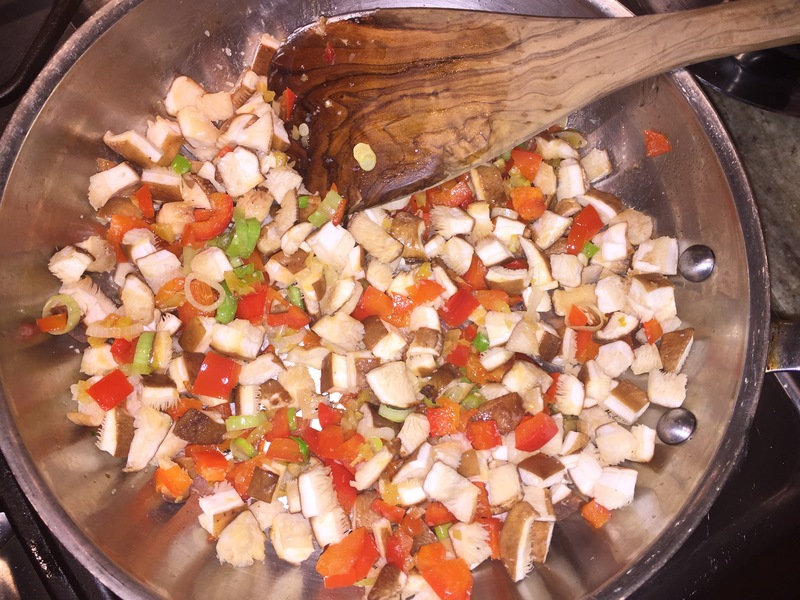 Continue to stir-fry until the stems are barely tender, about 2-1/2 minutes. Add the cabbage leaves, stirring quickly to move them to the bottom of the pan. As soon as the stems are just tender and the tops are barely wilted, 30 to 40 seconds more, remove from the heat and stir in the basil and 2 tsp. lime juice. Season to taste with salt, garnish with the scallions, and add more lime juice, if you like. Serve immediately. Chop the rest of the red pepper from the salmon dish. Heat a tablespoon or so of canola or peanut oil in a large skillet over medium-high heat. Add some minced garlic and fresh ginger, and cook, stirring constantly , until fragrant. 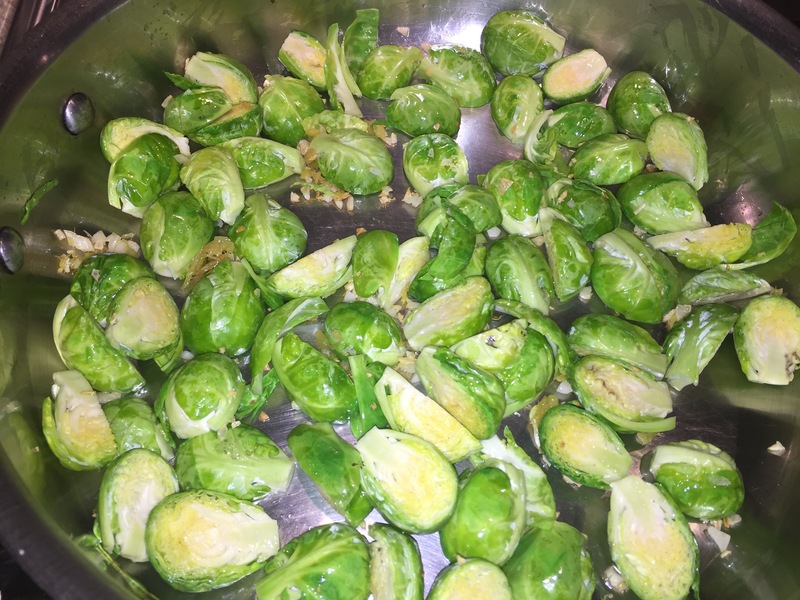 Add some trimmed, quartered (or halved, depending on size) Brussels Sprouts and cook, stirring until bright green. 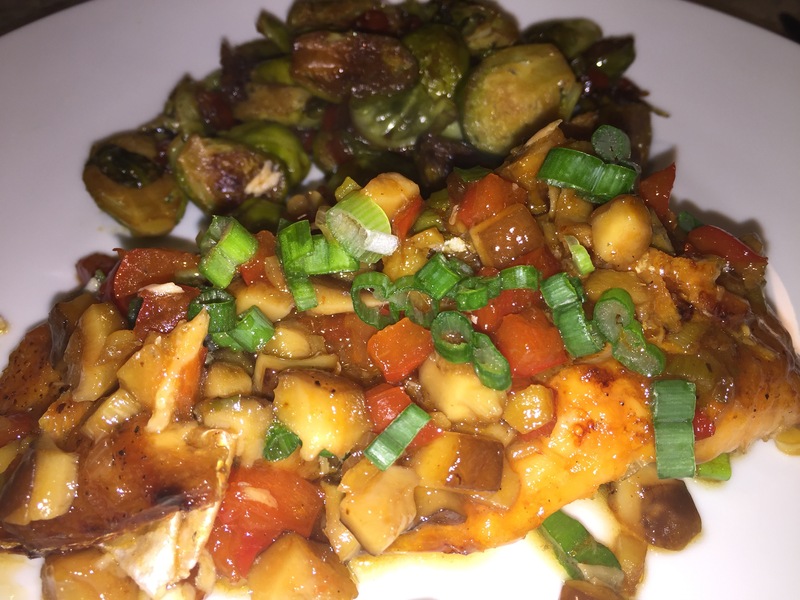 Add the red pepper, plus a tablespoon of soy sauce and a teaspoon or two of rice vinegar, then cover the skillet, reduce the heat to low, and cook until the sprouts and peppers are crisp tender. remove the lid, raise the heat, and cook until most of the liquid evaporates. The halved sprouts in the skillet with garlic and ginger. 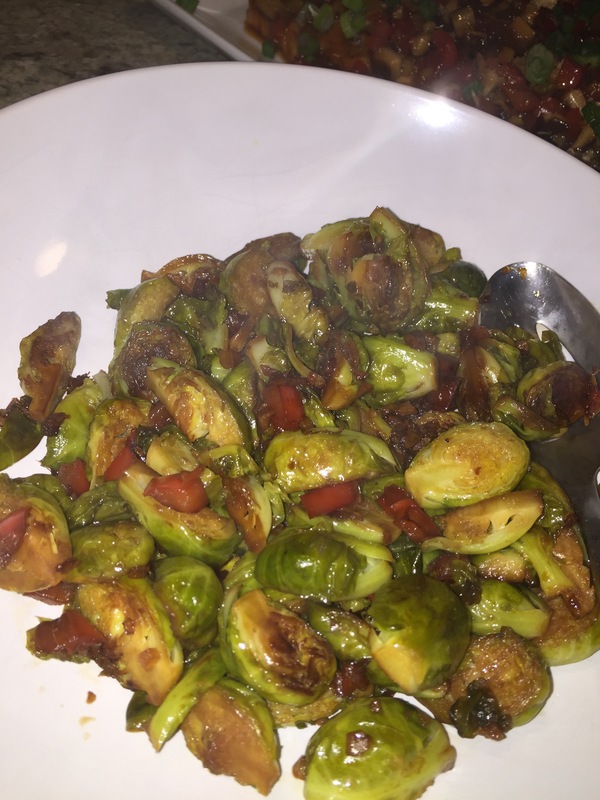 A close-up of the cooked brussels sprouts. 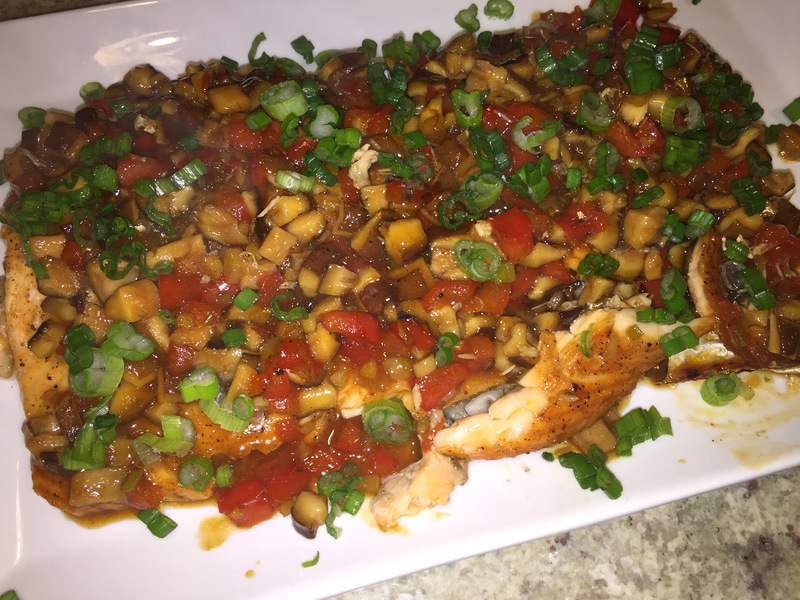 The salmon fillet covered with the chunky ginger shiitake glaze.